Lou, her mother and her younger brother and sister were abandoned by Lou’s gun-running psychopath of a father before the younger siblings were old enough to remember him as he really was. When their mother dies, Lou promises she’ll look after her siblings, Jeremiah and Teresa. The three kids end up in an orphanage, and Lou is determined to get them out of there and into a real home of their own. She’s maybe thirteen or so when she leaves the orphanage to find work. She finally gets it – cleaning in a brothel. At first, all we learn about this is that it didn’t pay as well as riding for The Express – not nearly enough for any hope of getting her siblings out of the orphanage – and if she could do the work of a man, Lou figured she was entitled to the better job even if she had to lie to get it. But there are hints of something more, perhaps even something not-quite-right, throughout the series. Finally, midway through the third season, we get the full story when a friend from that time period – one of the prostitutes from the brothel – arrives in town to start a dress shop: Lou was sexually assaulted by the man who ran the brothel. She'll arrive at the Mansion near the end of the first season. She's obviously very good at horseback riding, can do riding tricks as well as jumping. She's also good with a gun. None. She'll with the clothes on her back, and her glasses that help disguise her as a boy. Her gun is a nondescript Colt. 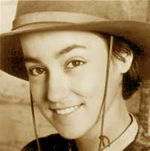 Lou McCloud is played by Yvonne Suhor. She's described as 'puny but spry.' She has dark hair and eyes, is very small and short for a male (probably because she's actually not), and wears glasses as part of her disguise. Instead of a non-traditional feminist girl, Lou’s a traditional girl who’s been abandoned and betrayed by the men who were supposed to – according to tradition – protect and care for her. Lou never mentions suffrage or any other feminist issues of her time, yet she instinctively believes she should have the same rights, privileges and responsibilities as men. Maybe it says even more about gender politics for a girl like her to embrace these ideas for their very practical value than for someone versed in feminism, which has always been defined by academics and handed down like the commandments to the rest of us whether it applied to our lives or not. Lou is just a girl dealing with a lot of crap in the smartest way she can figure out. For those who haven’t seen the show, Lou’s personality is most simply described as “assertive.” She stands up for her opinions and makes it clear to people what she wants from them. She can be very caring and emotionally sensitive, especially with the other riders, but when someone knocks her out of doing something she wanted to do and had earned the right to do, she’s not a bit more forgiving than she should be. When no one’s crossing her, you can forget for long periods just how forceful she’s capable of being. But you always get reminded again sooner or later throughout the series. Family: Her brother, Jeremiah and her sister, Teresa. 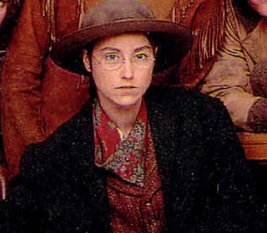 Affiliations (to a particular group, of origin, or not): Until arriving at the Mansion, she was an employee of the Pony Express.